A new review article in Agronomy Journal focused on the impact of temperature, CO2, and ozone on agronomic crops. Two new reports from the Nicholas Institute at Duke University explore greenhouse gas mitigation opportunities in agriculture. A literature review of the effects of harvesting crop residue on soil carbon and other quality parameters. NASA scientists explain the powerful effects CO2 has on the Earth's temperature. University of Nebraska research examines the effects of a one-time tillage operation on soil organic carbon and other soil properties. All indicators point to the reality of global warming, according to a recent NOAA report. A Greenhouse Gas Calculator for farming systems has been developed. A study determined the net Global Warming Potential of three grazing management systems in the northern Great Plains. Nitrification inhibitors significantly reduced N2O emissions compared with those of conventional fertilizers. If not for increased yields, additional greenhouse gas emissions from clearing land for farming would have been equal to as much as a third of the world's total output of greenhouse gases since the dawn of the Industrial Revolution in 1850. The National Research Council has recently issued three reports on climate change, and what actions the U.S. should consider in light of these findings. Soils around the globe have increased their emissions of carbon dioxide over the past few decades, according to an analysis of 439 studies. Those seeking to understand and predict climate change can now use an additional tool to calculate carbon dioxide exchanges on land. Scientists at NASA’s Goddard Institute for Space Science found that 2009 was tied as the second hottest year ever recorded. Based on a consensus of recent scientific research and modeling, a new report from USDA concludes that climate change is already affecting U.S. agriculture, land resources, water resources and biodiversity. Levels of greenhouse gases continue to increase, according to the World Meteorological Organization. USDA-ARS scientists are conducting research into how different nitrogen fertilizers and soils affect nitrous oxide emissions. The Nicholas Institute, working together with Duke University and Kansas State University colleagues, will coordinate and complete a transparent and scientifically founded review of GHG mitigation opportunities in the U.S. and abroad. This project, titled the Technical Working Group on Agricultural Greenhouse Gases (T-AGG), is funded by a Packard Foundation grant. A brief summary of the various economic analyses that have been done on the Waxman-Markey House cap-and-trade legislation. Research at The Ohio State University examines the effect of a tillage on nitrous oxide and methane emissions in a continuous corn cropping system. Research from a university in Spain examines the effect of a tillage on carbon sequestration rates in a semi-arid environment. Research at K-State examines the effect of a single low-intensity tillage operation on carbon sequestration in a no-till system. An interview with Chuck Rice, Professor of Agronomy, Kansas State University on the role of soils in climate change. Released to radio stations around the world during the week of April 13-17 as a global science podcast from the EarthSky network. 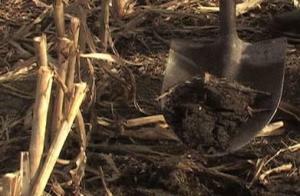 How the economics of soil carbon sequestration relate to other methods of sequestering carbon. Briefing by John Antle, Professor of Agricultural Economics and Economics, Montana State University, to the U.S. Senate Agriculture Committee on March 20, 2009. How agriculture can play a role in mitigating greenhouse gases. Briefing by Chuck Rice, Professor of Agronomy, Kansas State University, to the U.S. Senate Agriculture Committee on March 20, 2009. An explanation of the current status of the technologies for measuring and monitoring soil carbon levels. Briefing by Cesar Izaurralde, Pacific Northwest National Laboratory and Joint Global Change Research Institute, to the U.S. Senate Agriculture Committee on March 20, 2009. Climate change is projected to have a significant effect on agricultural production. The climate in Kansas is projected become warmer overall and precipitation more variable, with significant differences between eastern and western Kansas. Dr. James Hansen, director of NASA's Goddard Institute for Space Studies, spoke at the 2008 Kansas Wind and Renewable Energy Conference. He outlined the most recent findings on climate change, and his recommendations for immediate action. Feedback mechanisms are an important aspect of climate change, but little understood by the public. Dr. James Hansen, director of NASA's Goddard Institute for Space Studies, spoke at the 2008 Kansas Wind and Renewable Energy Conference. He explained the dangers of reaching the "Tipping Point" in climate change. National and state leaders in climate change research and policy recently spoke at a special symposium at Kansas State University. Presentations are posted here. There are three regional cap-and-trade programs that have formed recently in the U.S. and Canada. They are beginning to take action already. There is substantial economic potential for the mitigation of global greenhouse gas emissions over the coming decades, that could reduce or offset the projected growth of global emissions, according to the IPCC Fourth Assessment Report. A presentation by K-State's Chuck Rice at the Association of Ecosystem Research Centers on Sept. 25, 2008. Agriculture offers many potential opportunities to sequester carbon and mitigate greenhouse gas emissions. A presentation by K-State's Chuck Rice at the 2008 Kansas Wind and Renewable Energy Conference on Sept. 23, 2008. A newly opened exhibit on soils at the Smithsonian National Museum of Natural History. The advantages of a cap-and-trade system for greenhouse gas reductions. Try out this prototype online calculator of methane emissions from livestock. Main aspects of one of the primary climate change acts introduced in the U.S. Senate. In any manadatory greenhouse gas reduction policy, establishing an effective registry is critical. Whether any particular biofuel can reduce greenhouse gases depends on many factors. COMET-VR is a web-based decision support tool for agricultural producers, land managers, soil scientists, and other agricultural interests. A brief summary of the findings of the United Nations Intergovernmental Panel on Climate Change (IPCC) Working Group I, from its Fourth Assessment Report. A brief summary of the findings of the United Nations Intergovernmental Panel on Climate Change (IPCC) Working Group II, from its Fourth Assessment Report. A brief summary of the findings of the United Nations Intergovernmental Panel on Climate Change (IPCC) Working Group III, from its Fourth Assessment Report. The 2007 CASMGS Forum at Kansas State University was a great success. Speakers discussed a wide range of topics, from soil carbon measuring techniques to carbon markets, cap-and-trade legislation, cellulosic biofuel production, and climate change projections. PowerPoint presentations from the forum are now available. Conference presentations. The U.N.'s Intergovernmental Panel on Climate Change (IPCC) has issued its Fourth Report. A summary of the synthesis report reveals the most important conclusions. A new rapid method of measuring soil carbon called LIBS (Laser Induced Breakdown Spectroscopy) has been developed by scientists at the Los Alamos National Lab, and is being field tested at Kansas State University. Computer Decision Support System tools can model the predicted impact of land management practices on N2O emissions. How and why does agriculture contribute to greenhouse gas emissions of N2O, and how can these emissions be reduced? One of the challenges of soil carbon measurement is being able to take readings rapidly. NIR technology is making progress in this respect. The carbon credit pilot project from the Chicago Climate Exchange has a new signup period that extends until September, 2008. The UN Intergovernmental Panel on Climate Change (IPCC), along with former Vice President Al Gore, received the Nobel Peace Prize in 2007. CASMGS investigators have played a significant role in the IPCC. Chuck Rice, professor of Agronomy at K-State, explains how climate change and biofuel demands will affect agriculture in Kansas. See the complete presentation here. A University of Kansas Professor of Geography discusses the many ways that climate change may impact Kansas in the future. See the complete presentation here. There are several types of carbon markets operating throughout the world, and the differences may be confusing. The markets can be divided into two basic types: Compliance Markets and Voluntary Markets. Read a full discussion of these markets here. Renewable energy production and use (ethanol, butanol, and biodiesel) reduces greenhouse gas emissions compared to fossil fuel production and use. Some types of renewable energy crops have a much greater effect than others. Chuck Rice, director of CASMGS and professor of agronomy at Kansas State University, explains the basics of agricultural soil carbon sequestration in this short video clip.